I have to confess I love the idea of beauty advent calendars, just like beauty boxes, the excitement of opening up a daily treat in the run up to Christmas really appeals to me. This year there is a really interesting selection of advent calendars on the market, so I have chosen some of my favourites to share with you, in case you want to indulge! Holland and Barrett have been doing a great job championing natural beauty on the high-street and I love this advent calendar featuring some of my favourites such as Faith in Nature, Beauty Kitchen and Pure Potions. You get a total of twelve products, some very generous trial sizes and others full sized items including a make up item. I think this one is great value for money if some of the other advent calendars are out of your price range and the product selection is lovely too. Holland and Barrett are also one of the first high street retailers to go micro-plastic free, great news! When I first saw this advent on social media it made me very excited for Christmas indeed. This one is huge, with generous trial sizes and full sizes to open every day until Christmas Eve. It also contains a really good selection of products, skincare, body care but also items such as scented candles, so you definitely won’t get bored opening this up in the run up to Christmas. The design of this advent calendar is also one of the best I have seen, meaning it would make a wonderful gift for someone special. Espa is a fantastic aromatherapy and wellness brand available at Spa’s across the country (including the one I go to!). 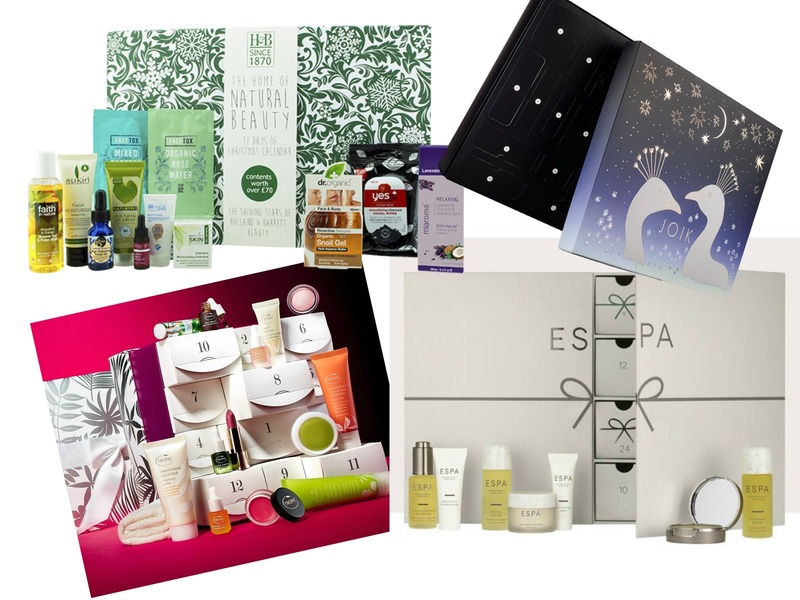 I really enjoy some of their products, including the body oils and this advent calendar really caught my attention thanks to Espa’s chic packaging. This advent includes 24 of the brands bestsellers, including the cult Pink Hair and scalp mud. This one will be a real treat in the lead up to one of the most stressful times of year! Tropic skincare has been one of my favourite brands for some time now, they have a fabulous selection of products and they are all certified cruelty free and vegan friendly. This advent has a gorgeous mix of skincare, body care and make up, including an exclusive cream blush and a fantastic colour click lipstick. With four full sized products, this advent is brilliant value for money and as always with Tropic everything is beautifully packaged. Available now for pre-order and will be shipped at the end of November. Although this calendar isn’t exclusively natural, it does include some fabulous products and brands and is definitely great value for money. I won’t reveal the brands included, but there are some cult favourites in there, including a fab brand that is organic and vegan. You can sign up now to the waitlist to be notified when it is live. Will you be indulging in a beauty advent this year? Which one is your favourite? Post contains affiliate links (affiliate links are marked with a *). Please see my full disclaimer for details.